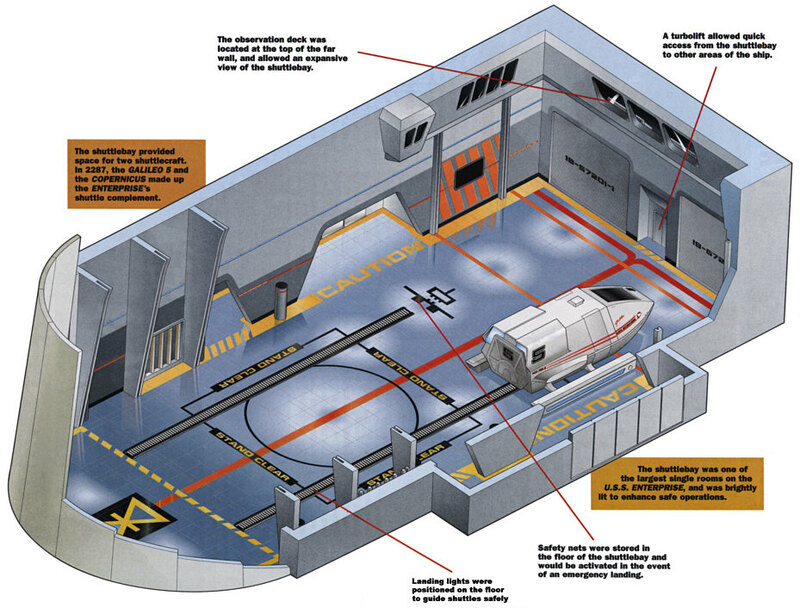 The shuttlebay of the USS Enterprise NCC-1701-A incorporated several new safety designs and upgrades. The single shuttlebay aboard the Constitution-class USS Enterprise NCC-1701-A was located at the rear of the starship's secondary hull, as on its predecessor. However, the newer starship had several design and systems upgrades to make the cavernous facility more space-efficient, and safer in the event of an emergency. In the late 23rd century, forcefields had yet to be applied to containing atmospheres in shuttlebays. Instead, the bay was accessed by a large pair of clamshell doors which parted in the middle and retracted into the sides of the vessel's hull. This opening allowed enough room for one shuttle to enter the bay at a time; once it had landed, the doors closed and the bay was repressurized. The interior was large enough to accomodate two shuttlecraft side by side. Above the far wall of the shuttlebay was an observation room with a row of three large windows facing onto the bay. This was used by personnel to oversee the safe landing of shuttlecraft, and also provided protection when the bay was exposed to a vacuum. Beneath the observation room there was access to a turbolift, and on each side of this were two large cargo doors which provided access to a purpose-designed storage facility; additional, temporary storage space was located on each side of the shuttlebay to allow the bay floor to remain unobstructed by scattered obstacles. The shuttlebay floor itself received particular attention during the design phase. Landing lights were prominently positioned to provide guidance during landings, and written warnings were displayed across the bay. Emergency nets were concealed within the floor, directly in front of the shuttle's landing spaces; in the event of a hard, manual landing these devices would erect almost instantaneously, and protect the far wall from damage.